Me again...my trip to Japan is approaching quickly, and my anxiety about my F3 arriving in one piece increasing. I certainly plan to be proactive in regard to speaking with the ramp supervisor. I have a couple more questions...every flight I've been on, they've unplugged the wiring to avoid accidentally having the chair turn on. The F3 has the circuit breaker switch in the back. Do you advise they be instructed to flip the breaker switch, or let them unplug a wire (!)? Does anyone label their chair in any way? My concern is arriving in/departing from Tokyo, and a lack of familiarity with the F3 causing confusion. Dont get your self so worked up...who are you flying with (what airline?) and there is no longer a need to disconnect the wiring that's old school. Just show them how to turn on and off. On your former post about lifting the chair on to the conveyor belt not all airlines have lifts but if needed they know how to lift it. I would say on my F3 from the drive tires and then someone in front and back to help with the weight. In regards to the F3 a chair is pretty much a chair when lifting some are more heavy but if they have to lift it normally it will take 4 guys. I would tell the supervisor your concerns and have him come back in and let you know once it's loaded. Hi, I will be flying on Japan Airlines out of JFK, direct. Your in good hands I have talked to a few that have used them and the had no issues just give yourself extra time so you can explain your needs and wishes. Dont over think it and enjoy your trip...have someone take pictures of your loading it really helps put others at easy when they are ready to fly. We leave on 24 September. This is not really related to my original question, but have any users of large power chairs had issue flying on E175 or E190 aircraft. I understand the cargo door sizes are approximately 35", so I imagine if you could recline the chair, you'd likely be ok? Also, a question I've been pondering is the break-even point for driving vs. flying. For example, my recent trip from PHL to FLL involved leaving the house at 4 am, departing at 7, and after taking the shuttle to the hotel, arriving after 11. So 7 hrs in travel time. Obviously it would take much longer to drive, so flying makes sense. But I'm considering a visit to Nashville, approximately an 11-12 hr drive. So is saving 4-5 hrs worth the expense (4 travelers) and hassle? For us eight hours (approx, 500 miles) per day is the absolute max that we want to drive...that includes gas, rest, and meal stops. Otherwise we make it a two day trip. Only one of us is driving, and it makes for a very long, long day, especially with the effort it takes to settle in for the evening at a hotel. Then of course there are the inevitable delays in traffic that you can't control, which can make that day even longer. We have family in Phoenix/Mesa, Arizona, that is about 750 miles or about 11 hours. We prefer to make that a two day road trip (four days, round trip) over flying because we really dislike the hassles of flying. We stop in Los Angeles, hook up with friends for dinner and start out fresh the next day. Bonus, we listen to a couple of audio books. Philly to Nashville is a pretty straight shot down 81 to 40. Hotels are cheap is east TN as well. I love to fly but hate flying with a powerchair. If it were me, I'd fill my tank and hit the road. But I also love driving. A side note we have flown 2 power chairs from Phx to NYC and San Diego a lot because one is a normal daily chair m300 or now F3 and then an offroad chair x5 for beach use in Coney Island or beach towns in California! Plus have fought with Supershuttle now only charges us for one van vs 2! Just curious how often you travel with 2 large power chairs? I've been considering purchasing the Frontier V6, as I'd like to be able to access the beach in many places that I travel (plus my sister lives down the shore in NJ). Do airlines ever have issue with traveling with 2 large pwc's? Do you pay extra? Do you check one of the chairs at check in, and gate check the other? I read that you usually travel with your wife...how does she manage the spare chair AND luggage? Permobil is a challenge when it comes to social media response and I am sure the person responding has no idea how to travel with a chair because they are not chair bound..
Every chair is different and so is each airport. 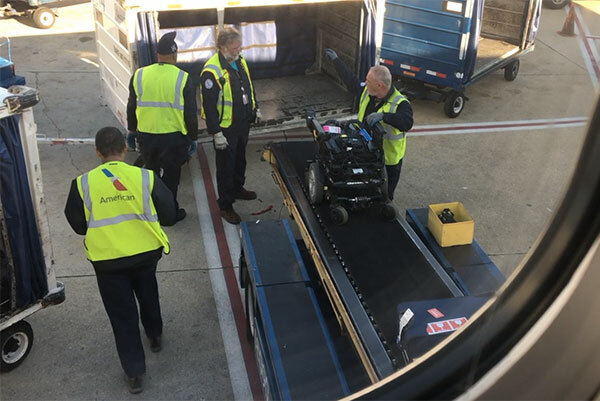 We fly Southwest and they have a power lift system that your chair rolls on to the lift then it raises to the conveyor belt. When they dont have the power lift 3 to four ground crew will left it from the frame and drive tires. Remind them prior to boarding not to load it on its side and reassure them it will fit through the cargo doors, you have to be the expert!